The Roseate Tern (Sterna dougallii) is a medium-sized seabird with narrow breeding distributions along both the eastern and western coasts of the North Atlantic Ocean and throughout the greater Caribbean region. From 2007 to 2009, Mostello et al. 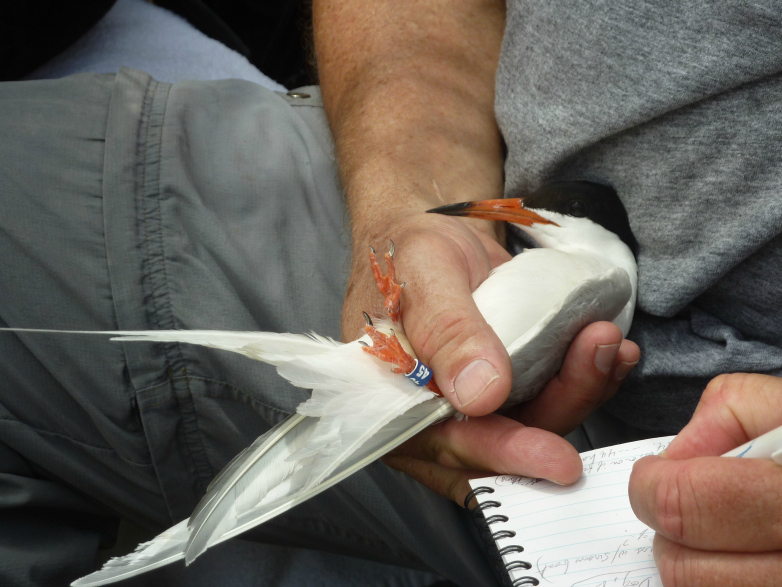 (2014, Seabird) recovered six geo-locators from Roseate Terns tagged in Massachusetts breeding colonies that identified possible migration stop-over areas around Puerto Rico and the Dominican Republic. Otherwise, very little is known about the species’ biology outside of the breeding season, when most mortality probably occurs (Nisbet, 2014, The Birds of North America Online). Adult Roseate Tern with 2.2 gram solar-powered satellite transmitter attached with a backpack harness. The western Atlantic breeding population is considered endangered and declining (U.S. Fish and Wildlife Service, 2010, Caribbean and North Atlantic Roseate Tern, 5-year review). The causes of colony fragmentation, local fluctuations in numbers, and steady regional declines are unknown, and no solutions have been identified. The study of migration, stopover, and wintering behavior of Roseate Terns has been handicapped by the lack of sufficiently small devices that can provide tracking data without retrieval (e.g., satellite transmitters versus geo-locators or GPS loggers). Because Roseate Terns weigh only about 100-115 grams (Gochfeld et al., 1998, The Birds of North America Online), tracking units must weigh less than 3 grams to comply with the established limit of 3% of body weight. On 24 June 2015, we deployed solar-powered satellite transmitters (PTTs) on two adult Roseate Terns captured in a nesting colony (~200 pairs) on East Seal Dog Island in the eastern British Virgin Islands (18.506N x -64.432W degrees). These transmitters, prototypes designed, built, and donated by Microwave Telemetry, Inc.(www.microwavetelemetry.com), weighed just 2.2 grams and were attached with a carefully-fitted backpack harness. The transmitters represent about 2% of the terns’ body weight, well below the 3% limit, less than the weight of a U.S. penny, and only 11% of the average weight of a Roseate Tern egg (Gochfeld et al. 1998). In the first two weeks of tracking, the tagged terns covered an area of at least 180 square kilometers within the British Virgin Islands and the transmitters performed extremely well. We expect the tracking data to begin documenting dispersal within the next two to three months. Then, if all goes as hoped for, we will watch and share the news as the southbound migration of these Roseate Terns unfolds and lead us to their wintering destinations. It is a privilege to be part of this exciting, ground-breaking effort. ARCI is grateful to Microwave Telemetry, Inc., and particularly to Paul and Julia Howey, for producing such valuable tracking tools and for donating the transmitters, paying for data acquisition, and contributing to the fieldwork. We also thank our project collaborators, Susan Zaluski (Executive Director, Jost Van Dykes Preservation Society, susan@jvdps.org), and Louise Soanes (Research Fellow, University of Roehampton, Louise.Soanes@liverpool.ac.uk), for involving us in their ongoing research on Roseate Terns and other seabirds in the eastern Caribbean; and to Captain Luverne Peterkin for safely conveying us to and from the study site. This work was conducted as part of a larger project funded by the Darwin Initiative, entitled “BVI seabird recovery planning programme” (DPLUS0035).